Wayne Hills Country Club | Rochester Golf | Golf Coupons | Go Golf U.S. Restrictions: Valid Monday, Tuesday and Friday AFTER 11 am. Restrictions: Valid ONLY on Saturday/Sunday/Holidays AFTER 10 am. Wayne Hills CC joined our discount service in 2017. They have so graciously offered two coupons which allows you to play the course up to 6 times! The first golf deal is limited weekdays ONLY. This allows our users to play at Wayne Hills Country Club for $25 including 18 holes AND cart on Mondays, Tuesdays and Fridays, ANYTIME after 11 am. You MUST call for a tee time and let the shop staff know you are with Go Golf U.S.! The Weekend deal is even better if you like to play mid-morning on the weekends. This deal allows users to play 18 holes AND use a cart for $40 on Saturday/Sunday and holidays, AFTER 10 am! Save yourself $40 if you plan on teeing it up mid-morning and cover the ENTIRE cost of the Rochester eBook for the year! With it’s unique design and picturesque surroundings, this golf course offers both challenging play for golfers of all skill levels and a natural beauty that envelops your senses. 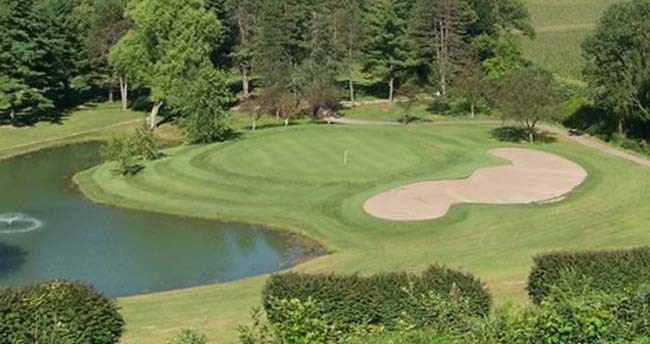 Wayne Hills Country Club offers an 18 hole championship layout that is a must play for any golfer. The Wayne Hills Country Club idea originated in 1953 when four Lyons golfers, Dr. Arthur Santelli, Alfred Santelli, Bob Baer and Leon Lewis, persuaded eight other area golfers that a family recreation center was needed in the area. The Wayne Recreation Association was incorporated under the laws of New York State in March 1956 and then became Wayne Hills Country Club, Inc. in 1963. The first nine golf holes opened in 1959. 1964 saw the construction of the 2nd nine holes with a complete watering system on both nines. In 2000 the original watering system was replaced with a new, state-of-the-art, computerized watering system. Redesign of sand traps will begin in Spring 2010.